Ronnie McKinnon on stage next to Derek Parlane, Alasdair Morrison of the Lewis and Harris Supporters Club and John Greig. Rangers legend Derek Parlane believes there is little loyalty left in the modern game as he sees so many of Rangers and Scottish football’s, talented teens lured away before even playing a senior game. After penning his first deal with Rangers at just 16 Parlane scored 80 goals over a decade at Ibrox in which he helped the club land three league titles, three Scottish Cups, three League Cups and the UEFA Cup Winners Cup. “I didn’t care about the Arsenal’s or Middlesbrough’s who were after me when I was 16,” recalled Parlane. “I just wanted to play for Rangers. That’s the big change nowadays and I played for that Rangers shirt as I was a real Bluenose. Now I see players kiss the badge on the shirt which I hate. I’m not just talking about Rangers here but in England or anywhere these players kiss the badge then two weeks later someone offers more money and they are off. Rangers recently lost the hotly tipped 16 year old Billy Gilmour to Chelsea with the teen snubbing the chance to continue his development at Ibrox and chance his luck in London instead. “I’m sure the kid would have played for Rangers had he stuck it out. 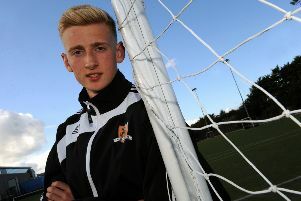 He looks great like a young Bobby Russell or a young Barry Ferguson,” said Parlane. Parlane was in Stornoway this weekend for another packed out question and answer session at the Lewis and Harris Rangers Supports Club, recognised by the club as the world’s biggest supporters club, alongside John Greig. “I love these occasions, I think they are brilliant,” grinned Parlane. Chatting to the Gazette this week the Light Blues legend was in cheery and reflective mood as he cast his mind back to putting pen to paper and turning a childhood dream into a career as he signed for his boyhood heroes. “When I signed for Rangers I was only 16 years old. I remember I signed my professional form in my Mum and Dad’s living room alongside the late, great Willie Waddell,” said Parlane. “It was surreal. There were other clubs in for me but when my Dad told me Rangers were in for me that was it, I only wanted to sign for Rangers. “Within a week of signing I was walking into a dressing room and seeing players in front of me who were on the posters on my bedroom wall. “Suddenly I’m in a dressing room with the likes of John Greig, Ronnie McKinnon, Sandy Jardine. I was overawed at first as I was young and a dressing room can be an intimidating place at that age. The conversation turns to the current Rangers side as they embark on their second season back in the top flight after a difficult period. But can Rangers seriously challenge Celtic this season? “Celtic at the moment are miles away off the field and Rangers cannot compete on the fiscal and financial side. On the field I think we are still a bit away from that,” he explained. “I’m surprised we didn’t use Murray Park more when we were in the Third Division as we were always going to win that league and the second which would have given us two seasons to get kids through the team. That’s when I think we needed to do it.